Transportation Costs > How Much Does a Party Bus Cost? A party bus can be rented and used as a “club on the go” for a party of any kind such as a wedding, concert, night on the town, prom or special occasion. These party buses can hold up to 50 or more people, and similar to a limousine, it can take you to a destination or simply drive you around town. On average, a party bus rental is going to range anywhere from $75 to $300 per hour. With most companies asking for a four-hour minimum, the costs will often be between $300 to more than $1,200 for a four-hour trip. The cost of a party bus will depend on the type of bus, the number of people, the date being booked, the amount of time, the accommodations and company offering the services. For example, RideMyPartyBus.com, a company we found online, offers their bus as a party venue for $125 to $150 per hour. They can accommodate weddings, proms, and other special occasions, according to the official website. Another company — BongoBus.com — charge an hourly rate, which can cost anywhere from $100 to $200 per hour, and they do not have an hourly minimum as they can pick up and drop off guests. 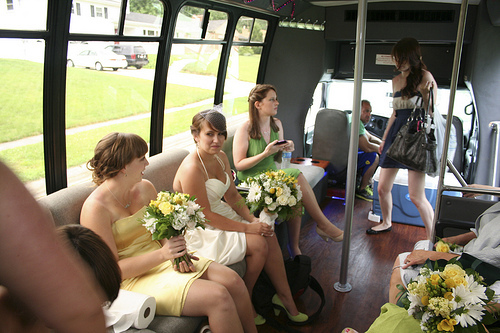 A double-decker party bus, while hard to find, can be rented as well. These buses, depending on the number of passengers on board, can cost anywhere from $75 to $325 per hour. Companies can either drive on a designated route or can drive to a destination of your choice, similar to a taxi. Most party bus rides last anywhere from four to seven hours. Most party buses can hold 20 to more than 100 passengers, and depending on the company policy, most allow you to bring alcohol on board; however, they won’t be able to provide it if the local laws don’t allow. These buses, depending on the company, will feature flat-panel televisions, music systems that play your music, dance poles and a “club” feel. For example, ATX Party Bus offers laser lights, televisions, dance poles and a multi-speaker sound system. Basic “party” buses may include the seating only and are designed to transfer a larger party from one destination to another. Silverfox Limos, on the other hand, has a six-color lighting system and a karaoke machine that features over 7,100 songs. A deposit of $150 to $200 will be required in order to secure your spot. This deposit will be tied to your final price once finalized. Gratuity is generally not included and most drivers will expect a 10 to 20 percent tip. Some companies may include a base tip, depending on the policy. A cleaning fee, if someone were to get sick on the bus, could apply. A cleaning fee often can cost $75 to $150, depending on the damage done. Mileage surcharges may apply to some companies if you travel 25 miles outside their radius. This can often be anywhere from $1 to $3 per mile, depending on how far the bus has to travel. For your own safety, always make sure the company you hire is registered, insured and licensed. If the company can prove their credentials, then it’s best to choose someone else. Also, check the DOT database to see if the carrier is authorized to operate. Considering reserving a bus during the slower months or days. Weekdays and the colder months are going to be a lot cheaper than the warmer months and weekends. Friday and Saturday nights after 5 p.m. tend to be the most expensive option. Check official company websites for coupons or any sort of promotions. Since this is a rather competitive field, it isn’t hard to find a deal with a reputable company. Don’t just focus on the price since you really want to compare apples to apples. If one company is $30 per hour cheaper but doesn’t offer any televisions, is it worth $30 per hour more for this amenity? When comparing prices, always make sure you’re comparing what you get with the cost as well. Some companies may have a day rate option that’s good for about 10 to 12 hours of drive time. This option can be cheaper if you need the bus for the entire day.